"She isn't coming yet. Toto - did she hurt you? She tried to, didn't she? 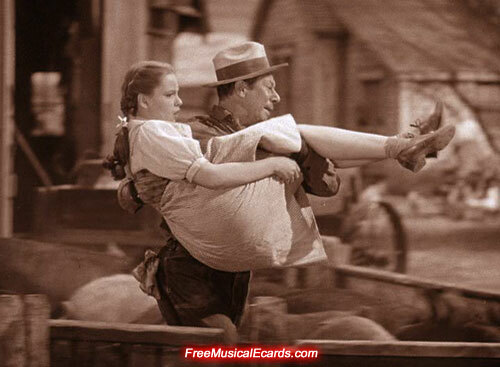 Come on, we'll go tell Uncle Henry and Auntie Em!" 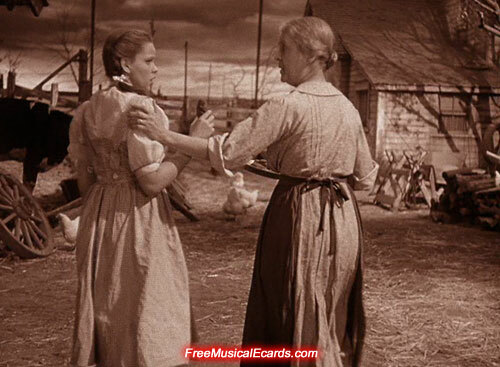 Apprehensively, Dorothy rushes into the bustling family farm and flings open the gate where her guardians - Auntie Em and Uncle Henry are counting eggs/chicks - their source of income - and worrying about their broken down chicken incubator. 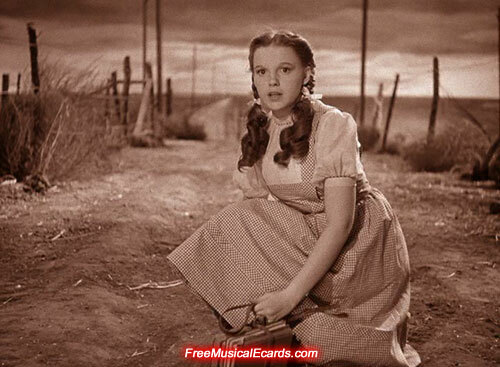 (They bluntly ignore their real "chick" - Dorothy herself). 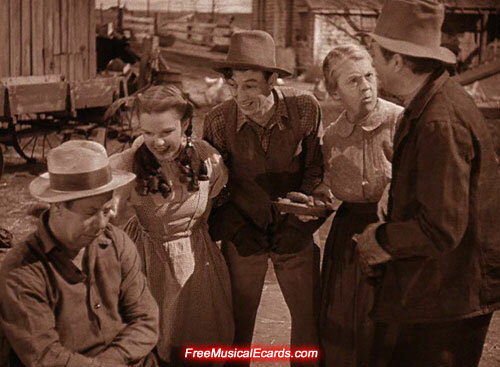 She attempts to tell them about their nasty neighbor, the dreaded Miss Almira Gulch. 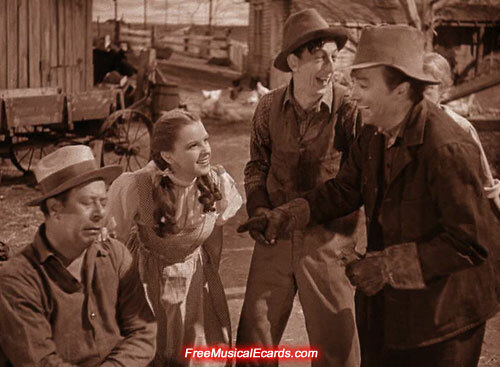 Dorothy takes her problem over to the farm's hired helpers who are fixing a wagon in the farmyard - maybe they will listen. 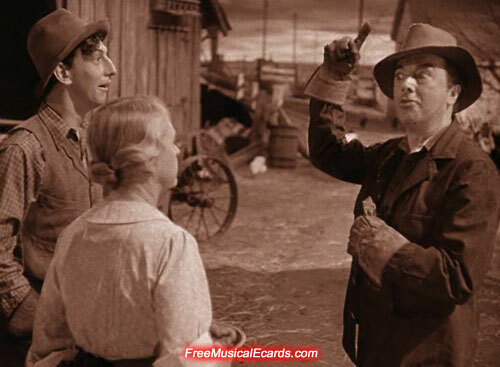 Tall and slender hired man Hunk, quickly characterized as lacking brains and intelligence (foreshadowing his other role as the brains-lacking Scarecrow), off-handedly counsels Dorothy, prophetically, to use her brain - and not walk home near Mrs. Gulch's house to avoid trouble. Farm worker Zeke is herding the hogs into a fenced enclosure. 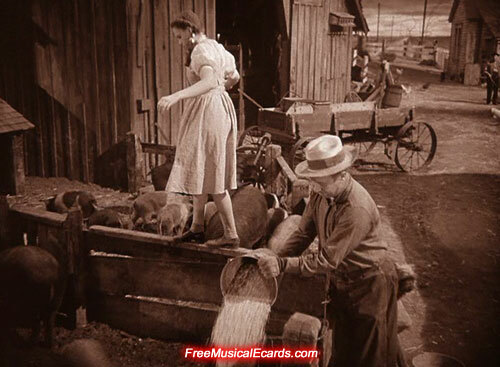 As Zeke feeds the pigs and Dorothy tight-rope walks precariously across a pig-pen fence top, he prophetically advises the distraught girl to have courage (foreshadowing future scenes of his own bravery and cowardice as the Cowardly Lion). Dorothy topples off the fence railing into the pig sty, causing Zeke to frantically haul her out from the squealing pigs and rescue her from being trampled - and then faint with fright at his own bravery. 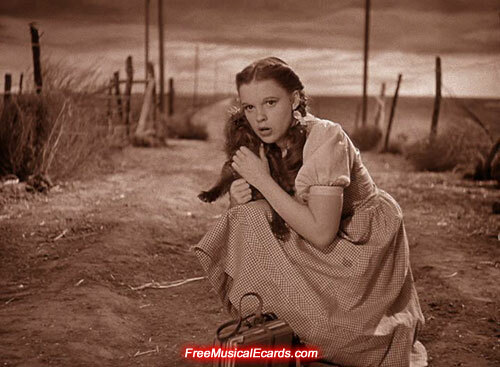 After being rescued, Dorothy realizes: "Why Zeke, you're just as scared as I am!" Hunk teases Zeke: "What's the matter? Gonna let a little ol' pig make a coward out of ya?" The third hired hand, Hickory, who has been preoccupied with "tinkering" on a metal contraption joins the commotion. Auntie Em is disturbed by the "three shiftless farmhands" and their "jabber-wapping when there's work to be done," but Hickory, who desires social status and respect boasts (foreshadowing a future scene in which, as the Tin Man, he is frozen with rust like a statue): "But someday, they're gonna erect a statue to me in this town." She jokes with him: "Well, don't start posing for it now." 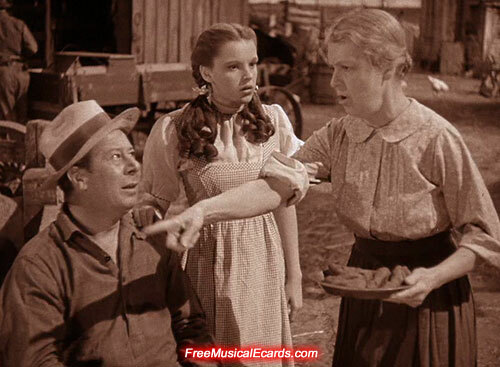 After giving everyone some freshly baked crullers (fat-fried sweet cakes), Dorothy's Aunt rebuffs her and sternly chides her for causing trouble - suggesting that she find a place where she won't get into anyone's way. "Now Dorothy, will you stop imagining things. You always get yourself into a fret over nothing. Now you just help us out today and find yourself a place where you won't get into any trouble."